Every entrance is a grand entrance as you pull in under the oversized portico designed to shelter you and your guests in all weathers. Handcrafted in hardwood ply, it's scale and quality hint at the generosity that awaits inside. The soothing sound of trickling water melts away all signs of stress as you enter the main pavilion. It's not simply a water feature, it's an inside-outside pond, complete with goldfish and water lilies, set among a landscaped courtyard garden - your very own tropical resort. Clustered around the courtyard garden, the 4 pavilions combine with gently varying floor levels to add intrigue - this is no rectangular box that can be taken in on one scan of the eyes. 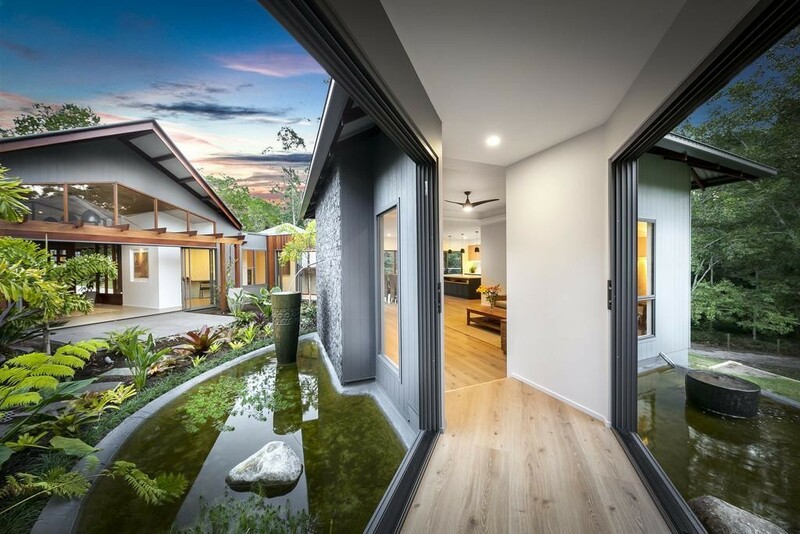 Built in 2018 to exacting standards, the immaculate home, in an immaculate neighbourhood, offers complete privacy thanks partly to the bordering native forest which is under covenant forever more. The rear of the home enjoys the perfect northerly aspect. A crisp, fresh palette of cotton-sheet white and basalt grey offers a subtle backdrop on which you can imprint your personality with splashes of colour through artworks, textiles and personal treasures. Delightful modern feature lighting is already in place. Ultra-clean lines extend through the home, nowhere more so than the kitchen, where the generous island bench, topped with white stone, sets off the honey oak and raven grey tones of the stylish cabinetry. Quality appliances include a 900mm Smeg gas cooker. Messy cooks will drool at the walk-in butler's pantry which has oodles of storage. When you get the urge to cook outdoors, step out to the deck where a large covered pavilion, replete with inbuilt barbecue and fridge, is the perfect spot for lounging while keeping an eye on the kids as they frolic in the 9.5m saltwater pool. The paved terrace/patio offers guests room to spread out and catch some rays. Even on chilly evenings, you're spoilt for choice - the lounge-dining space overlooking the courtyard, the family room across the bridge, or the gigantic, gallery-like lounge room which needs no artworks other than the framed views of nature visible through a captivating series of double-hung windows. When the party's over, retreat to your serene master suite where the ensuite bathroom will thrill even the most jaded traveller. The beautiful glass shower may get little use, eclipsed as it is by the private outdoor shower and freestanding stone bath, set in a lava-stone pebble courtyard with vertical garden and just a splash of hot pink bougainvillea. Light floods the master bedroom through soaring windows that look out to clipped lawns and a wall of trees. The spacious walk-in dressing room, with its woody look and airy feel, is simply fabulous. Other members of the family will not feel short changed. All three additional bedrooms are large with walk-in robes and the main bathroom is luxurious, with huge glass shower and a freestanding egg-shaped bath. For overflow visitors or wannabe independent teens, the nearby guest house ticks all the boxes - separate entrance, modern kitchen, bathroom with huge shower, lofty 10ft ceilings, aircon and queen bedroom with built-ins. Be warned, they may be reluctant to leave. A safer option might be to rent it out - in this prime location, in this peaceful environment, it would be snapped up in a heartbeat.